Disciplining people's online behavior does not contradict President Xi's demand for more tolerance and patience to internet users. Shen stressed that internet users' behavior should also be subjected to supervision, the same as people's offline behavior. Much like the United States' relies on American-based "backbone enterprises" like Microsoft, Intel, and Google, President Xi's 2016 speech and the policies developed since his speech underscored the need for China to push for self-reliance and to promote Chinese information and communications technology alternatives, wherever and whenever it is feasible. As both a global economic and military power, such an approach makes sense for China. Strengthening China's innovation capacities will allow for Chinese companies and state enterprises to join forces in order to reduce foreign involvement in China's IT sector. Something else to note that most Western media and commentators missed in Xi's 2016 speech: his concern that China is suffering from a serious issue with "brain drain," as talented young college students go abroad for their studies and often stay there. Xi urged technology firms to build talent structures that can recruit experts from many countries and draw Chinese expatriates back home. That call is now paying off with Chinese students returning home to work in their home country's burgeoning IT and high tech industries. 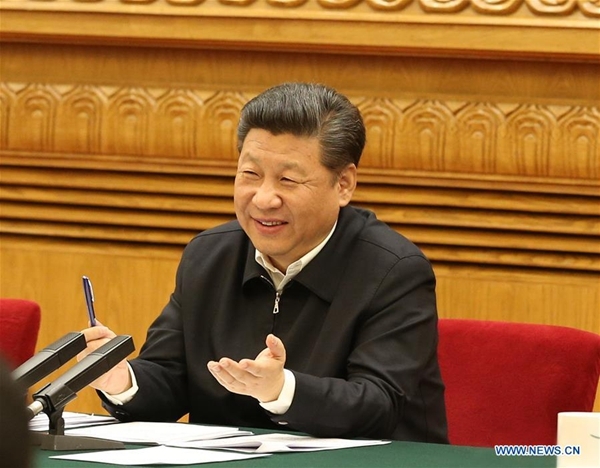 President Xi's new theories, ideas and conclusions on cyber security and informatization form an independent concept on governance of cyberspace with China's characteristics. They are part of his ideas about the governance of China, answering a series of major theoretical questions concerning the long-term development of China's informatization and providing comprehensive and clear strategic guidance. A careful balance needs to be struck between top-down and grassroots needs, restrictions, and ambitions. The Internet is an immensely powerful tool for development, information exchange, opinion making, and communication, but users as well as governments need to take their responsibilities in setting their own boundary conditions; maintaining one's personal cyber security requires adoption of the same type of due diligence as for securing one's personal security in the offline world. China's continuing opening up, including in the context of unrestricted internet access for its hundreds of millions of netizens, offers real promises of enhanced economic benefits and a reduction in the nation's digital (and economic) imbalance between the urban and rural populations. Without advanced defensive technologies, to guard against cyberattacks is like making bricks without straw. Only with powerful technologies could a country detect the menace and launch defense accordingly. Xi has been trying to balance the need for cyber defence and the desire for technological development. For the development community, government restrictions are counterproductive, for those charged with protecting the country, it is a necessity. Striking the right balance is about leadership. Allegations that US intelligence hacked the SWIFT messaging system, used by banks to transfer trillions of dollars each day, hacked Microsoft's software, are examples of what every government fears. Beyond this, the ability to use of big data to manipulate public opinion, exhibited by Cambridge Analytics, in the passing of Brexit and the election of Donald Trump, indicate a new frontier of concerns. On the development side, access restrictions to the internet can impede development and innovation. For China to realize its economic potential, it must be able to use the same information and tools, if it is going to successfully compete. Achieving a happy medium is a challenge for all nations, the question is will China blaze a new path or follow established models. As pointed out, real solutions in these areas will be at best compromises. Being the mainstream doesn't mean being obsolete. Mainstream media certainly need develop their online services, and consider how to make their voices reach more people in a faster way in cyberspace. Xi Jinping pointed out that the recent advances in computer technology present many great advantages, but also many potential dangers. Xi seems to understand that technology is best used for advancing prosperity and building a better world, not for sewing destruction and chaos. He points toward the way to carefully move forward and make sure that these technological advances are used for productive and beneficial purposes. Internet represents one of the most momentous headway in the history of humankind. Its development has changed and will continue changing the way people communicate, establish relations, do business and exchange information and knowledge. But it has also a dark side in that it can be used in an irresponsible way and with malicious intent. The inability of western legislators to properly regulate its use and fight its misuse has allowed a large amount of fake, illegal and harmful information to be easily accessible to anyone at any time. It is therefore crucial that governments direct their attentions to the risks brought about by internet and, while enhancing its benefits and further development, adopt strategies to counter its deleterious use. In this regard, the speech President Xi Jinping pronounced a year ago at a symposium on cyberspace security and informatization outlines a positive platform for the Chinese government to make sure that internet remains a driving force for China's economic growth and an instrument of progress of its people.